Handmade in Kyrgystan, these felted, natural wool rattles are stitched with funny food details. Baby can't hold a fork yet, so let's start with some finger food. These food rattles are seasoned especially for a baby's palate—spice-free. (Food-free, if you want to get technical. ) Handcrafted in small batches by artisans in Kyrgyzstan, they're made from natural wool that's dyed, spun, and felted before being cut and stitched with deliciously cute details. 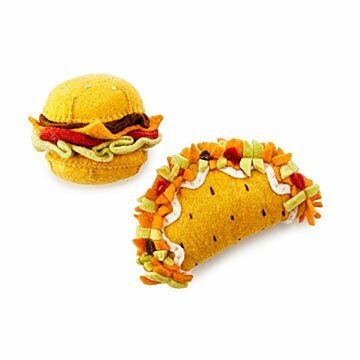 Choose burger or taco. Shower gifts with good taste. Designed by Gulnara Kydyrmyshova . Handmade in Kyrgyzstan.